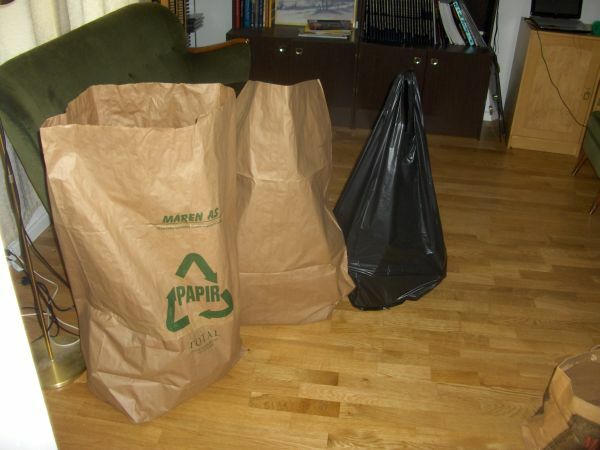 My own austerity measures: The first sacks of things to throw away before moving to the smaller place. More sacks to follow. I have written a few times about the near future, after peak oil and peak metal and so on. What I have sketched is not a disaster scenario. Disaster scenarios are good for selling books, and I agree that if we act like complete morons, we can make a disaster out of it. Then again we can make a disaster in paradise itself, as the Jewish creation mythos so beautifully explains. This tendency lies in us all and must be watched. Seeing pictures of Greeks rioting in the streets not only brings home this human tendency to make a mess of things, but also an even more ingrained human tendency: To never give up something you already know from experience that you can live without. This is not a pure evil: It is kind of helpful for a marriage, for instance, that you won’t give up on your spouse at the first bump in the road, even if you survived for several years before even meeting them. But for the most part, it is people torturing themselves. I am going through my own austerity measures these days. Getting less for the same money is the trend of the future, and I have started (somewhat unexpectedly, in my case) since I have to move from a house to half a house for the same rent. In the process, I am once again going through the things I’d like to bring along, and sorting out things that I won’t realistically have room for. The thing is, I started my adult life with much less than this. It took many years before I even had my first bookshelf. It is like my material riches have increased by 1000% and now I have to go back to 800%. Not really something to riot over, I think. I can see how people who planned to retire at 50 will be upset that they can’t. The whole thing I am going through now is an exercise in how to (not) react when you find out that people break their promises if they have the power to do so. That is unfortunate, but when the promises were a bit too good to be true, when we were living our dream, simply going back to reality should not be the end of the world. Retiring at 50 or even 55 is certainly dreamlike, at least if you have a job you hate. But the best response to that is to either get a job you like, or like the job you have. Almost all jobs consists of helping other people (because that is the only thing people are likely to pay for, if they have a choice). So by rising your love to a very high degree, you can usually find satisfaction in any work that is not contrary to law or decency. I have every intention of working till 75 if my health holds up. That is not a certain thing, of course. But as far as I see it, retirement is not natural. It should not really exist. Rather, people may get disability pensions when they are no longer able to work, whether it happens at 20 or 90. If you want, you can of course quit your job at any time, but I don’t see why one should be rewarded for that. The way Europe at least has organized this, people have paid for other people’s retirement for decades, so it stands to reason that they want to get their money’s worth. But that money is not saved anywhere. It is already spent, on other people’s retirement. So it is not like you can give them back the cash. Given that we all face a period of austerity, I think it is more important to support those who are actually ill, over those who are actually lazy. When the money is gone, it is gone. The tooth fairy won’t bring it back even if you break somebody’s teeth. It is like that with all things. The only certain thing about anything on earth is that it will end. As the Buddha said: “All things that have form are subject to decay.” I hear even the protons will decay some hundred billion years from now. We should salvage the happiness we can find during our journey through time, collect the good memories and learn from the unpleasant. For each of us there will come a time when we won’t get any more memories from Earth. There is more joy to be had from austerity than from rage. Believe me, I have tried both.